This November brings the first Veterans’ Day in seven years with no American servicemen or women in combat. Yet while combat officially drew to a close in August, more than 50,000 troops remain in Iraq alone. A small ministry at Grace Community Church, a Grace Brethren church in Seal Beach, Calif., continues to stand behind those still deployed, as they have since 2001 when troops were first sent out. Support Our Troops is a small service team working under the wing of Grace Community (Donald Shoemaker, pastor). 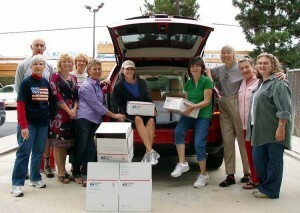 The volunteer group gathers and sends consolidated shipments of letters and care packages to military personnel overseas. According to the church website, their goal is simply to “provide encouragement” to soldiers, sailors, airmen and marines. “We serve troops in far places and hazardous situations,” says coordinator Ed Hull. The ministry began eight years ago when Grace Community members Laurie and Curt Fulton “saw the need early on to let our soldiers in Iraq and Afghanistan know that we support and honor their service.” Last year the Fultons moved to northern California, and fellow church members Ed and Judy Hull stepped up as the ministry’s new coordinators. The transition caught the Hulls at a good time: Ed was just wrapping up involvement in another ministry, and both he and his wife were between full-time jobs. Today the ministry supports five units, most of which come from the nearby Southern California area. Support Our Troops starts by initiating contact with each unit, generally through its local deployment team or through contacts at the Joint Forces Training Base nearby in Los Alamitos. Support Our Troops’ efforts are the kind any secular outreach organization might provide, and indeed, many of its partners are completely unaffiliated with the church. Community organizations, like the local Elks Lodge or the Orange County Red Cross, furnish both donations and manpower. Outside organizations give substantially, if sporadically, donating several hundred dollars at a time. It’s patriotic, humanitarian-type work any community organization might undertake. But the organization’s affiliation with Grace Community Church makes it more than that—it makes it a ministry. Besides granting Support Our Troops nonprofit status—a perk for donors, since contributions are therefore tax-deductible—the church gives the team its most consistent assistance. From the soldiers’ perspective, Support Our Troops becomes a distinctly Christian ministry because the hands they receive the packages from are acting as part of the body of Christ. Unit chaplains are the primary point-of-contact for distributing the shipments, so small gifts—from sunblock to Slim Jims—become a cup of water given in Christ’s name, from a church in California to a soldier overseas.